The week before Trumbo‘s red carpet screening at this year’s BFI London Film Festival, NSA whistleblower Edward Snowden joined Twitter. And though that may be mere coincide, it feels like no accident. 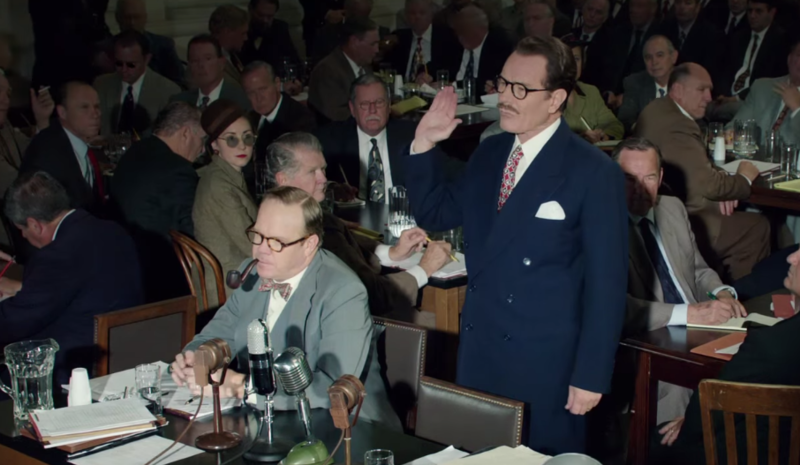 Played by Breaking Bad’s Bryan Cranston, Dalton Trumbo was an Oscar-winning screenwriter whose career was all but ended after he and other Hollywood figures were blacklisted for their communist beliefs. Trumbo is the true story of his crusade against the American government and studio bosses as he fights for the right to write. The film captures the frightening horrors of the communist witch hunts that took place as recently as 1975. In Cold War America, believing in communism automatically made you a suspected traitor or terrorist. In this sense, the movie evokes defenders of free speech and civil liberties today. Both Trumbo and Snowden saw themselves as defenders of of those civil liberties, not as traitors. Liberal Americans like Trumbo had turned to communism before the Second World War, after the Great Depression, worker’s rights and fascism in Europe led liberals, and particularly intellectuals, to question the government. However it’s worth noting that where Snowden leaked state secrets about the NSA’s spying powers, Trumbo was simply a private member of a legal and recognized political party – one the American government vilified. In 1947 Trumbo, along with several others, refused to divulge his political allegiances to the congressional House Un-American Activities Committee, protesting: “This is the beginning of an American concentration camp!” As a result, In 1950 Trumbo served an eleven month sentence for contempt of Congress. Perhaps predictably, the film hasn’t been universally well received, with some accusing it of being too biased towards liberal views. Indeed, John McNamara’s script is a scathing satire of political extremists – particularly on the right. The unfortunate effect is that the film is sometimes too kind to the left, portraying conservatives as ignoramuses who have nothing worth saying. Helen Mirren’s casting as the main antagonist, gossip columnist Hedda Hopper, was a clear attempt to combat this. However Mirren’s character was surprisingly one dimensional: There was a clear sense that Hopper was a formidable, independent woman, but her politics weren’t given a compelling justification. But perhaps a film favouring the left is appropriate at the moment. Trumbo arrives at a time when socialism has become a dirty word in politics, despite the fact that most Western countries have socialist welfare states or healthcare systems. The British Labour Party’s Jeremy Corbyn has to convince middle England that his socialist beliefs don’t make him more extreme than Nigel Farage, whilst across the Atlantic, the Bernie Sanders faces a similar task if he wants to beat Hillary Clinton to the Democratic nomination. Considering that the film deals with such serious themes, it has an incredible levity – one undoubtedly owed to director Jay Roach (whose previous work includes Meet the Parents and Austin Powers). Without a hint of exaggeration, I’d call Trumbo the wittiest film of the year – the screening I went to certainly seemed to achieve as many, if not more laughs than the likes of Trainwreck, Me and Earl and the Dying Girl and even Spy. Trumbo, then, comes highly recommended. I’d be surprised if Cranston didn’t pick up a few award nominations for his work, and the film was a brilliant piece of liberal art. Unapologetically, Trumbo declares that people have the right not only to believe in anything, but to say anything. Trumbo is set for release in the UK on February 5th 2016.